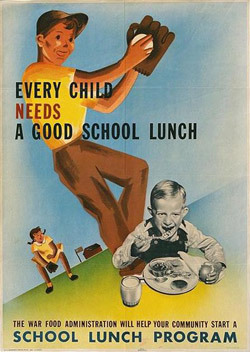 Like victory gardens, home canning, and depression-era resource conservation, Slow Food USA’s Gordon Jenkins believes the idea of healthy school lunches is one worth revisiting. Jenkins and his colleagues at Slow Food USA have spent the summer organizing Time for Lunch, Slow Food’s first nationwide grassroots advocacy campaign focused on getting real meals in front of the 30 million children who eat in today’s cafeterias. At the core of the effort is the Child Nutrition Act, a bundle of legislation including the National School Lunch Program that is up for reauthorization by Congress at the end of this year. 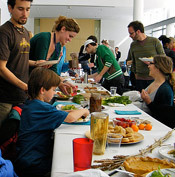 To draw attention to the issue, Slow Food chapters in 49 states have planned a national Day of Action by staging 295 Eat-Ins — or potluck gatherings in parks, civic centers and backyards — as a way to engage communities, build bridges, and show Congress that school lunch is a priority. 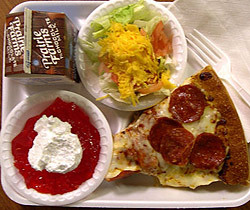 Because school cafeterias essentially function as stand-alone businesses that get no funding from school districts, they rely solely on the reimbursements they receive for free and reduced meals and the income they generate when students buy what they serve. It’s not hard to see why many have resorted to serving what students will buy. And the drive to create novel, kid-friendly products like bubble gum flavored apples and rootbeer flavored milk means kids don’t have much reason to make healthy choices. Of course, it’s the same forces that have shaped children’s diets outside schools that shape what they eat between classes. The problem dates back to the 1980s, when Congress opened the doors to private food service companies. When schools are given commodities from the USDA, most send them straight to companies to be processed. Over the years it has become much more cost-effective for schools to send their chicken, for example, to Tyson and to get it back in the form of chicken nuggets, than to prepare it in their own, often under-funded, low-function facilities. Can’t make it to an Eat-In? Visit the Slow Food USA site to sign the petition. Are you San Francisco parent interested in joining the SFUSD school lunch advocacy group? Join SFUSDFoodFuture list serve.